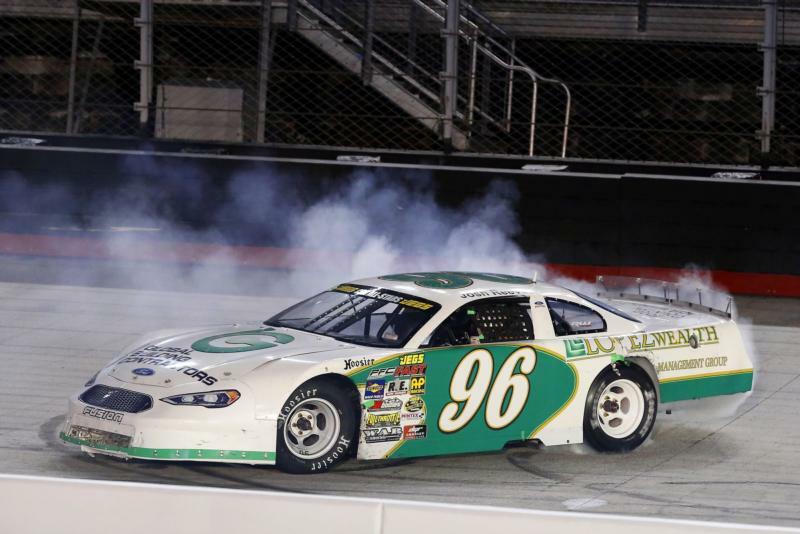 BRISTOL, Tenn. - Local favorite Josh Reeves raced to victory Friday night in the 100-lap JEGS CRA All-Stars Tour race at Bristol Motor Speedway. The race was the first of six feature races scheduled for the three-day Rusty Wallace Automotive Group Short Track U.S. Nationals. Reeves, from Bassett, Va., powered his green and white No. 96 Lopez Wealth Management Ford past Jordan Miller and Matt Maurer to take the victory. Reeves drives for Abingdon, Va.-based Wade Lopez. "It means so much," Reeves said. "This team works so hard. I don't even know what to say. This is without a doubt the biggest win of my career. Just to get this win for Wade and the team for giving me a chance means the world to me. We didn't have the best practice session or the best qualifying, but we're here with the trophy and it worked out for us. I can't believe I won Bristol. This is amazing." Reeves started 18th and said he battled a vibration during testing and practice, but he and his team kept fine-tuning the car and finally hit their stride in the closing laps of the race. In leading the final eight laps he was able to get the victory just before a rear tire went flat. "There was so much emotion in those last few laps," Reeves said. "I knew that tire was going down. I could feel it. We were fortunate to hang on to get the win." Reeves, who also works as a crew member for the Abingdon-based Henderson Motorsports NASCAR Truck Series team, said his crew chief, legendary stock car tuner Chris Carrier who has wrenched many laps at BMS over the years, shared the secret to having success at The Last Great Colosseum. "He said you are not here to race everybody else you are here to race the track," Reeves said. "That is the mentality I have. We are all facing the same monster, we are all David and that's Goliath and we have to treat it with respect. That's what I did during the test and this weekend. Because of that, staying out of trouble and staying level headed through it all, I believe that's why we were able to capitalize." There were several crashes during the race, including two that affected early race leaders Mike Skinner and Jack Smith. Veteran NASCAR driver Skinner, who earned the pole and dominated most of the race, was pulling away with 29 to go but ran into lapped traffic where he plowed into the rear of Tyler Hufford's machine. Skinner's FocusPoint Private Capital Group Toyota received damage to the suspension in the incident and had to exit the race. Another driver with NASCAR experience, Jack Smith, was caught up in a crash from the top spot with eight laps to go when Justin South attempted to make a three-wide pass from the inside lane and made contact with the rear of Smith's No. 28 machine. Smith spun into the wall and collected Michael Clancy Jr.'s car in the incident. There was a brief skirmish in the pits after the incident between the two drivers and respective teams as they expressed their disagreement over what happened on the track. In other racing, Bo Hoelscher took the checkered flag in the 10-lap Vore Compacts All Star Dash and rookie racer Zach Bube claimed the win in the 20-lap Vore Compacts New Star Feature. Saturday's racing features the 100-lap Late Model Stock feature, and 50-lap feature races for the Modifieds and the Compact Tour. Sunday's features include the 100-lap Super Late Model race and the 50-lap Street Stock race.